In the grey seas and dark skies of turbulent chaos, you see a long black dragon-shaped ship. A dozen massive oars on each side row to the beat of a thundering drum. Tall, harsh-faced and dark-hued, fully-armored forms walk the deck, shouting orders in terrifying voices . . . the Formians come again. A power has risen in the Otherworld, it drives the storms upon the shores with such force that they batter the earth and grind the rocks. Those ill fortuned enough to dwell near the sea hide in terror at the fury of the storm unleashed. But it is not the storm they fear, it is the giants that ride the foamy surf. Formians! Giants of the old world they come, riding long ships across the mad-capped seas to surge up against the settlements of men; raiding with wild abandon, plundering, burning, hauling off treasures and slaves with few to impede their crimes. But there is method here, something, or someone drives the Formians, pushing them to reckless heights. Who and why are tangled in the intrigues of local lords, wizards, and their sons. It is your task to unravel the Gordian knot that is The Giants Wrath. This adventure is about the terrible raiding that the Sea Giants are doing to the coastal villages in the Mortal world and the sinister plans of their leader, a human wizard called the Stormgazer. In the progress of these adventures, the characters must make their way across the seas to the Otherworld to confront the wizard and his Giants to put an end to the terror. 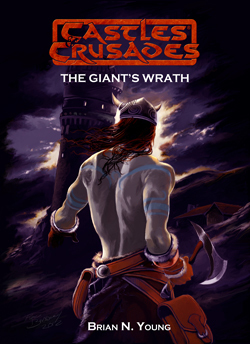 This story deals with many strands of Celtic mythology, both Irish and Welsh, and places them in the context of a fantasy setting that is easily integrated into Castle & Crusades Aihrde. This series of adventures places the characters into a tough and brutal story where there is little subtlety once the blood begins to flow. This module is designed for 3-4 characters at 3rd- 8th level or higher, predominantly with warriors and those capable of sustaining themselves in combat against epic odds.